As a child I remember the remarkable, tennis-ball flowers of onions and leeks that had been left in the ground the previous year. Why pull up onions, I wondered, when they can produce flowers as spectacular as this? The memory of those flowering onions has stayed with me and I always plant lots of Allium, the onion family, in my garden. Ornamental onions can liven up the garden as much as their edible cousins do a simple salad. 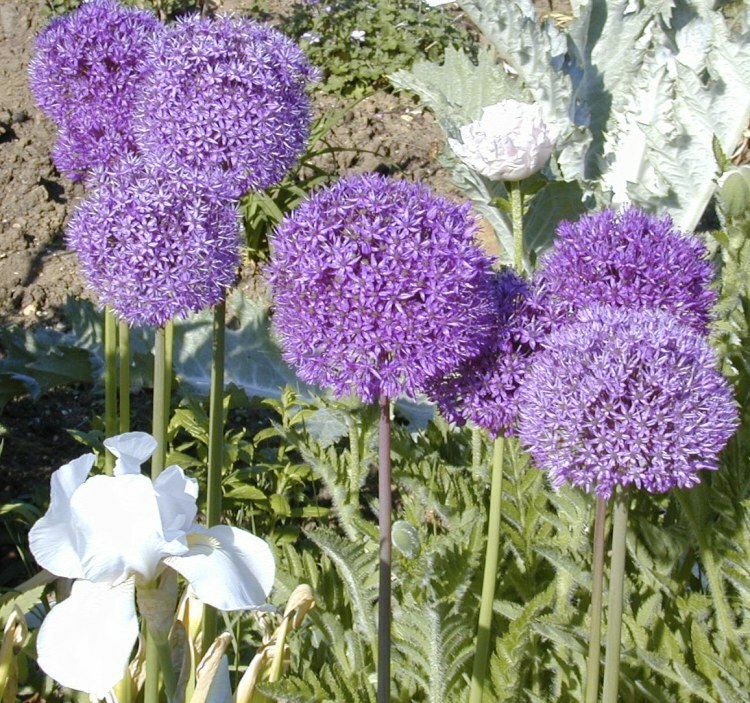 Some alliums are both decorative and edible. The humble chive, Allium schoenoprasum, shouldn’t be confined to the outer edges of the vegetable plot. Its short, compact stature and prolific flowering make it a good plant for edging paths or running in drifts through other low-growing plants. The common form has deep pink flowers with a peppery taste that can be eaten raw in salads. A. schoenoprasum ‘Forescate’ is taller, with rose-pink flowers; just one of a dozen or so cultivars. In my garden the gleaming white A. schoenoprasum ‘Silver Chimes’ grows in clumps amongst sprawling plants of a purple-leaved stonecrop, Sedum ‘Bertram Anderson’. So-called Chinese chives, Allium tuberosum, have broader leaves, and white flowers that are more open than other varieties but which are just as floriferous. 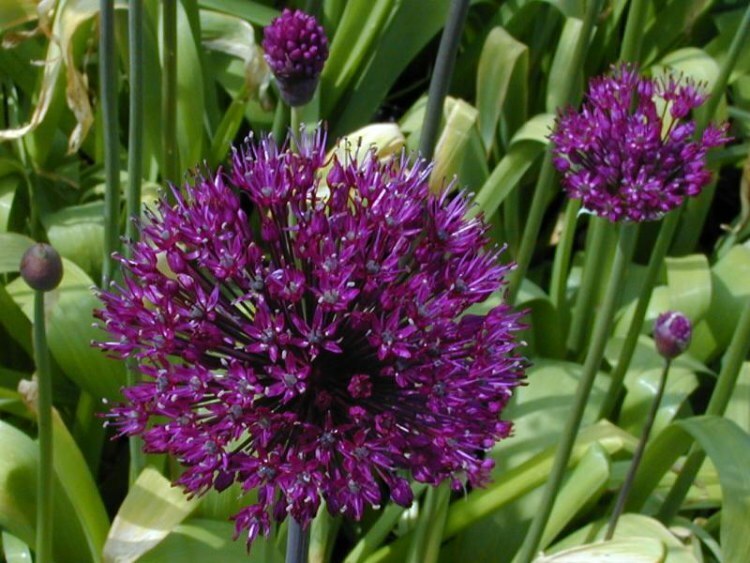 Like all alliums, chives are full of nectar and are a magnet for bees and butterflies. Chives are demure plants in comparison to their tall ‘drumstick’ cousins, Allium hollandicum and Allium aflatuense. With the appearance of coloured tennis balls on sticks, these are easy-to-grow plants that always look dramatic punctuating the garden during May and June. Few flowers are as companiable as these and they look good with irises, with paeonies, with roses, with tulips: but rarely by themselves. Always put them where they can grow up and around other plants. You can buy varieties in tones from white and pale mauve to deep purple, but my favourite are the rich purple flowers of A. hollandicum ‘Purple Sensation’. The intense colour is so strong that it provides a startling contrast to bright-leaved shrubs like the golden currant Ribes sanguineum or the gold mock orange, Philadelphus coronarius ‘Aureus’. A few years ago I planted a border of ‘Purple Sensation’ with dark purple tulips and a pale blue bearded iris. I loved the final effect but it was spoiled by the unfortunate trait that many tall alliums have: tatty foliage. Don’t worry if the leaves of your tall alliums are frosted and brown: it happens to all of us. The trick is to place them amongst plants that will grow over their leaves and hide the mess. You can cut them off to the ground but there are usually too many other things to do at this time of year. Mine are now hidden by masses of dark blue forget-me-nots but you could use violas or anthemis in the same way. 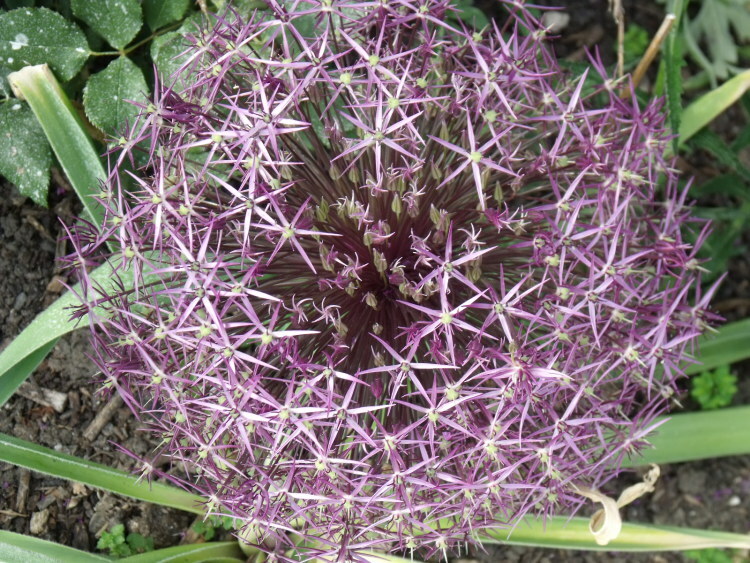 The only Allium that does have well-behaved foliage is Allium karataviense, whose greeny grey leaves keep their shape and colour until the end of summer. Each bulb has just two flat leaves a few inches from the ground that act as a nest for ivory-white flowers. Last year I added to my Iris and allium border an allium relative, Nectaroscordum siculum. Until botanists decided it should be in a family of its own this plant was an allium and you will sometimes find it sold as A. siculum or A. bulgaricum. As tall as A. ‘Purple Sensation’ and flowering at the same time it has muted, dusky pink bells that dangle from the top of the flower stem. A classic cottage-garden plant, it looks at its best when planted in large drifts amongst aquilegias, siberian iris, old-fashioned roses or growing through the ferny foliage of bronze fennel. As summer progresses allium flowers will fade, leaving behind beautiful seed heads that will last through to the autumn. Flowers of the drumstick alliums become rust-brown spheres, while the Nectaroscordum flowers close together and point upwards as they dry. The most impressive seed heads, though, belong to shorter alliums, Allium christophii and Allium schubertii. The flowers of A. christophii are made up of hundreds of metallic purple flowers that form a sparkling globe about 20cm wide. Being only 40cm tall it is at its best when nestling on grey-leaved catmints, silver artemisias or lamb’s lugs, Stachys byzantina. I’d like to claim credit for the eye-catching combination of A. christophii in a froth of white love-in-a mist, Nigella damascena, in my garden but it was a fortuitous accident: the Nigella just seeded itself around. As the seed heads dry, the allium becomes a bleached-white exploding star against the russet pods of the nigella. The real supernova, though, is A. schubertii, a firework of dusky pink stars shooting out at different lengths to form a ball 40cm across. I grow them under the skirts of a silver-leaved shrub, Elaeagnus ‘Quicksilver’, where their dried seed heads stay throughout he winter. Not all tall alliums have stout stems: those of Allium sphaerocephalon are so slender that its small, dense, dark-red flowers seem to be magically held in mid-air. The willowy stems mean that it is a plant that needs the support of others to hold it upright. The first time I tried growing it I planted a large clump by themselves, imagining a spectacular mass of tall flowers: what I got was a straggly, broken-down mess. To keep them upright they are now planted amongst Panicum virgatum ‘Heavy Metal’, a metallic-grey upright grass that has burgundy seed heads . The two grow to about the same height and together create the hazy blur of an Impressionist painting. You can get a similar effect with other grasses, such as the glistening clouds of Stipa capillata or one of the Calamagrostis family of grasses. If you prefer something more vivid, try it with a tall sea-holly such as Eryngium planum, which has blue cones the same size and shape as the allium. Whatever you grow it with, you need lots of flowers to make an impression. It’s not an expensive bulb, so don’t be stingy. A few alliums flower later in the summer and these tend to be shorter and don’t have the typical drum-stick flowers. Allium. carinatum subsp pulchellum has wiry, grass-like leaves and stems about 35cm tall and clusters of dangling amethyst flowers that shoot upright after they have been pollinated. It’s a colour best suited to being near pale lavenders, pale pinks and other muted colours, although I have seen it grown effectively thorough the golden foliage and dark purple flowers of Geranium ‘Salomé’. A. cernuum is similar in size and habit, but with larger, pink bells and thicker stems. Like most bulbs Alliums need a well-drained soil and prefer a sunny position. If you have heavy clay dig plenty of compost and horticultural grit into the soil before planting them. Alliums bought in pots can be planted at any time but you will get more for your money if you buy them as dry bulbs in the autumn. Metal plant-supports or bamboo canes used to hold tall varieties up will always look ugly and unnatural, so grow them through other plants to give support. Not all Alliums are well-behaved; some are invasive weeds that can be difficult to get rid of. The white, starry flowers of wild garlic, Allium ursinum, may look pretty in the dappled light of woodland, but in the garden the plant will seed itself everywhere and smother less vigorous plants. As well as producing copious amounts of seedlings each bulb surrounds itself with dozens of tiny bulblets that are almost impossible to dig out. Just as tempting, but equally troublesome is Allium triquetum: this, too, will quickly swamp other plants. However attractive they may seem in magazine photographs or nursery catalogues, only plant them if you have acres of woodland for them to romp around in. If you already have them in the garden never put them on the compost heap, as this will just spread them around even further.